Siamo a 5' dalla città fortezza di Palmanova (1600), monumento nazionale; 15' da Aquileia sito archeologico romano; a 25' dall'isola di Grado, madre di Venezia, famosa località balneare da dove sono possibili escursioni via mare verso la Croazia e visite alla splendida laguna. Trieste, città mitteleuropea, è a soli 40' con il Carso triestino dove si può visitare la Grotta Gigante capace di contenere la cupola di S.Pietro in Vaticano. Cividale, fondata da Giulio Cesare nel 50 A.C. e poi longobarda, inserita nella lista dei Patrimoni dell'Umanità è a soli 35'. 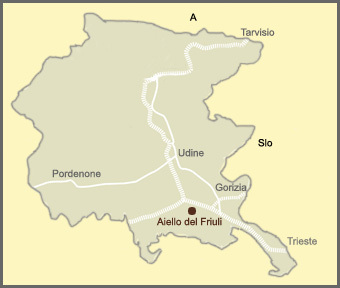 Molte altre sono le località e i siti che potremmo consigliarvi, non solo per godere del patrimonio storico paesaggistico del Friuli ma anche, volendo dedicarsi alla scoperta dei vini (ottimi quelli delle colline del Collio) e dei piatti tipici del Friuli. The central location of the villa means guests are perfectly situated to travel to both the mountains and the sea as well as an array of stunnig destinations. Aiello is only 5 minutes away from the fortress city of Palmanova (1600), national monuments, and 15 minutes from the Roman archaeological site of Aquileia. The city is just 25 minutes from the island of Grado, motherland of Venice and famous beach resort where you can take excursions by sea to Croatia and visit the splendid lagoons. Trieste, the city hailed as the true heart of middle Europe, is 40 minutes away, featuring the stunning seaside cliffs of the Carso where you can visit the "Grotta Gigante", a cave so enormous it has the capacity to fit the entire dome of St Peters Church of the Vatican. Cividale, founded by Julius Cesar in 50 A.C. and later occupied by the Longobards, is recognised as a United Nations World Heritage site and is only 35 minutes by car. In addition to local historical sites, we are also happy to recommend an array of local gems, including some of the best wineries in the world located in the Collio and a selection of local restaurants where you can enjoy traditional Friulian cuisine.